i think i've noted this before, but sometimes when i can't figure out what i want for dinner, i just type "vegan" into the grubhub search and see what comes up. i've seen dimo's pizza on there a billion times, but i generally go for lou's when i'm in a pizza mood. so one night, i decided to actually click on the menu and take a peek. UM. woah. actual vegan pizzas? with vegan cheese & all? you see, at dimo's : "we see pizza as our crispy, chewy, edible passion -- a platform on which we can imagine all our culinary ambitions." 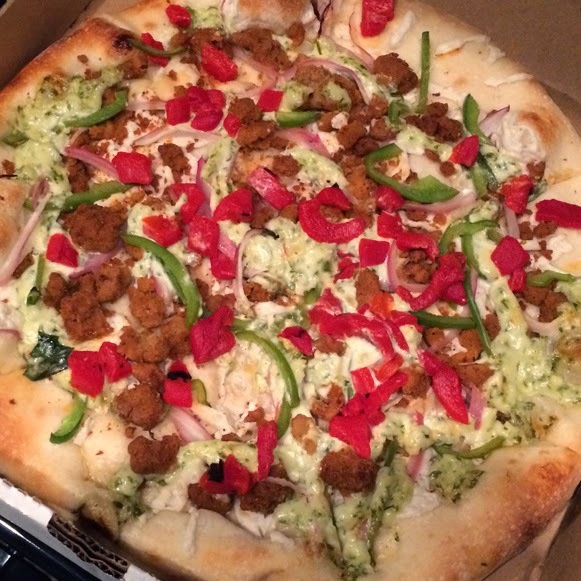 welp, a vegan pizza is just as good a platform as a non-vegan one! roma tomatoes, sauteed spinach & artichokes on a marinara based, topped with mozzarella teese. i would say that this is a fab vegan version of a veggie lover pizza. to be honest, it was really really good. 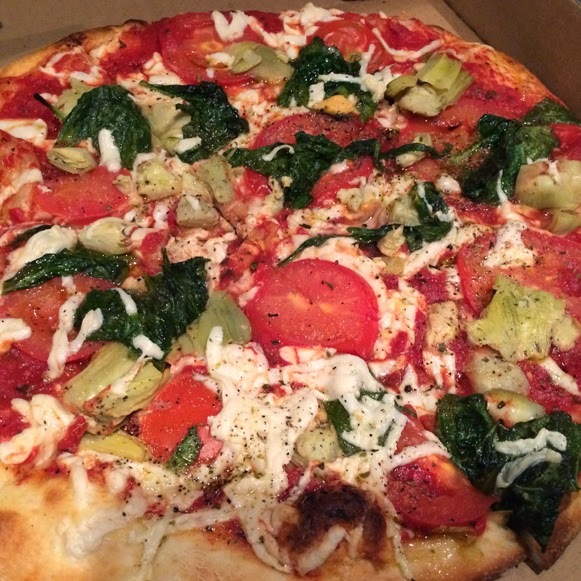 but my issue is that i was super into the non-typical pizza offerings from dimo's. see below. mozzarella teese, upton's chorizo sausage, red onions & bell peppers on a vegan ranch base. did you read that correctly? vegan ranch base. WHAT. that's it. that's all i've got to say. since i took these pictures about two months ago, i've ordered dimo's not once, not twice, but three times. the vegan philly is my absolute fave ... my other fave? the VEGAN MAC & TEESE PIZZA. next time i get it, which i am certain will be soon, i'll share a pic on instagram. (follow me!) because i know you'll want to see/eat/experience that for yourself.